69 Km from the town, is built at the northwestern part of Chios island on a rocky mountain. Unique caves extend below the present village, a complex of at least three chambers, the largest of which is approximately 200 meters. 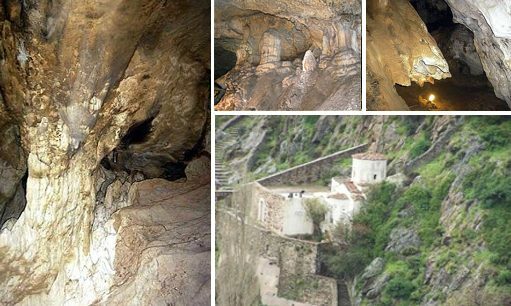 People settled in this cave during the Early Neolithic period (6000 – 5000 BC) and lived until circa 2700 BC. Fragments of clay objects, as well as animal bones, indicate that the cave was also used as a sanctuary from Archaic to Roman times. Since the Byzantine era to the present day it has served as a place of Christian worship, consecrated to Panagia Aghiogalousaina (Virgin of the Holy Milk). There is also a tiny chapel of St. Anne within the cave. The village’s name came after “the milky water” (gala=milk) dropping from the stalactites of the cave.